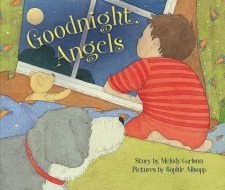 Goodnight Angels, by Melody Carlson is a simple, cute and fun board book for kids! This book is written in a similar fashion to Goodnight Moon, except it places God at the center. The story focuses on a little boy who is saying goodnight to the world around him. At the end of his day, he prays to God thanking him for his blessings, love and care. It is a great way to teach children that each day, it is good to look back at all that God has given us and done for us and to be thankful. This would be a great bedtime story for the child who has a hard time transitioning to bedtime. The story goes through a typical bedtime routine from having to come in from playing outside to taking a bath and brushing teeth. It is a wonderful tool to help children understand that a bedtime routine is normal. This book can help to calm the senses as this particular boy's routine is being read. Disclaimer: I received this book as apart of the Book Look Blogger Program. All opinions stated are my own.